Maybe your a traditionalist, and you love the idea of sharpening your pumpkin carving knife, toasting pumpkin seeds, and creating a cleanly cut Jack-O-Lantern. Or, maybe your kids are grown, you don’t like the cleaning up of the oozy orange contents of the pumpkin, or simply think they rot too soon when cut. Whatever your reason, there are several options for festive pumpkins that don’t require any knife skills at all, and just to prove it, we have our five favorites here. 1. Ribbon and Creepy Crawlers. 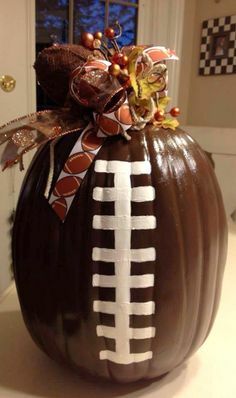 Tie a ribbon at the top, or glue ribbons around the entire pumpkin. 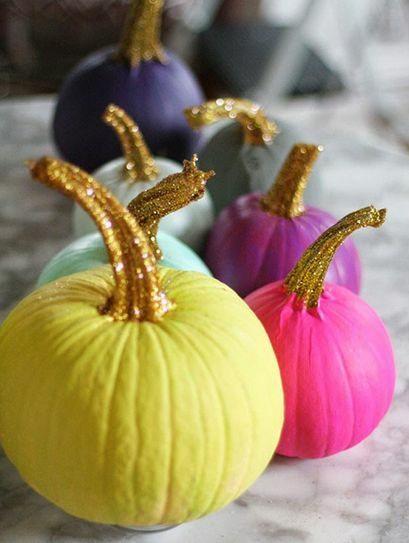 Using ribbons is an easy way to add color and design to a very simple pumpkin. 2. Creepy Crawlers. Add a spook factor to your pumpkins with fake spiders, ravens, snakes or rats (you can find many of these at your local dollar store). Adding the “ewww” factor is oh-so-creepy! 3. Glitter and bedazzle. Glitter, gems, and metallic paint are a few shining examples of how to create a lot of impact with very little effort. 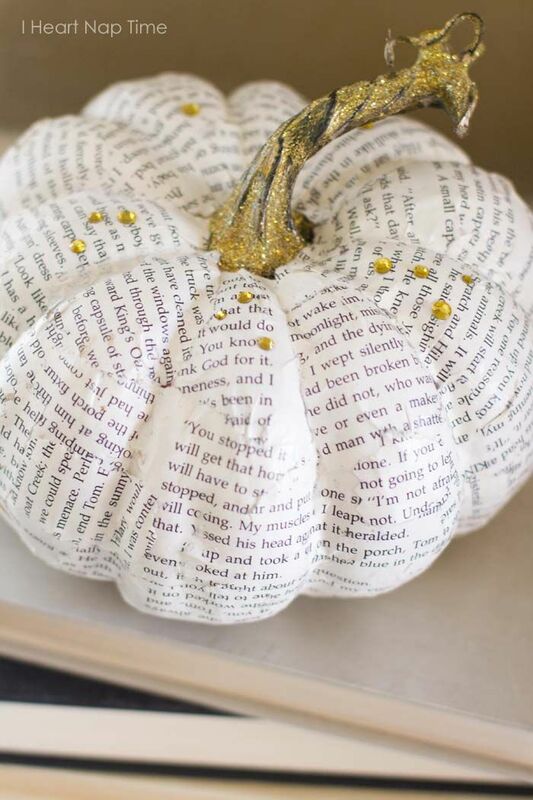 Glitter the stem, the entire pumpkin, or glitter and bedazzle. The result is a very sophisticated and attention grabbing pumpkin. 4. Paint. Very popular because it requires so few tools, painting your pumpkin is a way to brink your Jack-O-Lantern into this century. 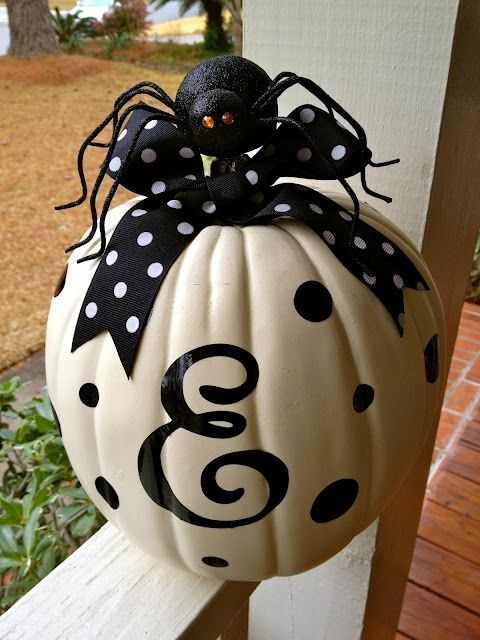 Play with polka dots, initials, shadows, stripes or words like “Boo!” Be it a very skilled artist, or artistically challenged, there’s a way for anyone to make a beautiful, painted pumpkin. 5. Glue. Glue on paper doilies, clusters of bird cut outs, burlap, felt, wrapping paper, newspaper–or anything that might turn your boring pumpkin into a decoupage masterpiece! Even the most skeptical might change their minds when they see the clever creations that come from creating a pumpkin masterpiece out of ribbon, creepy crawlers, glitter, paint and glue! No carving required!